Most of the computer users out there must have felt a need for increasing or decreasing (resizing) partition size after it is created, at least once. And if you are working in a production environment you might at times need to make a large partition, by combining small hard disks of various size, so that, it appears as one large hard disk/partition to the operating system. The above mentioned things can be achieved by a technology called as Logical Volume Management or commonly known as LVM. Heinz Mauelshagen wrote the initial code for LVM that works on a HP Unix system. Later on, all modern day Linux distributions began to use it as a mechanism to provide flexibility in storage by providing the capability to resize, and combine multiple physical hard disks of various size to a single logical volume, for the operating system to use. 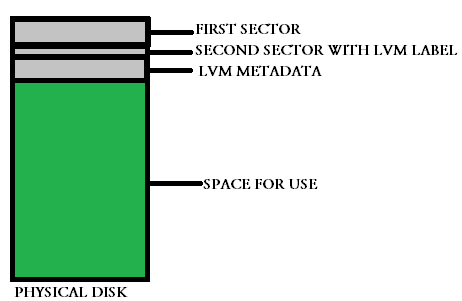 LVM can be defined as a software disk management on top of physical hard disks, in order to provide features such as making large volumes by combining multiple hard disks, easy resizing of a partition, removing of physical disks without affecting data online, improving the throughput by striping data across multiple physical disks, easy backup management with the help of snapshots etc. LVM also provides, mechanisms that are similar to raid level 1 and raid level 0(mirroring and striping), if you are interested in understanding raid, i will recommend reading the below articles. Keep the fact in mind that throughout this guide, we will be using Red hat/Centos based distributions for understanding LVM. The implementation of LVM on other distributions are almost the same. Please let us know in case you face any issues, while following this guide. Also please let us know you views and suggestions to improve this article(or any article on slashroot.in), through comments. In order to understand LVM in a easier way, we have divided each and every component of LVM into different parts, and each part is studied separately. In this section let's go through each and every components of LVM. As we have discussed earlier, a large partition can be made by combining different hard disks or partitions together. Physical disks or physical volumes are either entire hard disks or partitions. You might ask why partitions? LVM is a software implementation, hence you can supply a partition of any size, or an entire physical hard disk of any size, or a single big partition made out of a hard disk, as a physical disk. Either you allocate a hard disk, or a partition, as a physical disk, you first need to label that device as physical volume for LVM. This labeling of the device(a partition or a hard disk) can be done by adding a label at the second sector of the device, by using fdisk command. This kind of labeling the partition or hard disk will make identifying a physical volume easier. Repeat the above mentioned steps three times to create 3 partitions of 100 MB. We will be using these three partitions as Physical volumes for LVM, so lets change the partition label for them to LVM. This can be done by the following method. Command (m for help): t            ------------->> t is used to change the partition system ID. In the above shown method, we have changed the partition label type to 8e (which is used to label a partition with Linux LVM type). Do this for all the three partitions we have created, so that all of them can be made to LVM physical volume type. Keep the following things in mind, while changing the type of a partition to LVM in Linux. The below points mentions the reason for changing the type, what does the type change do. Label also provides a Unique Identification to the physical volume. To understand what is UUID in a partition, i will recommend reading the below post. Let me make that point clear once again. We have used partitions while creating physical volumes in the above example(3 partitions of 100 MB size), however you can use whole hard disks as physical volumes in LVM. The contents of a physical volume are depicted in the below diagram, to make the above mentioned points about physical volume very clear. The above shown picture gives a clear idea about how a physical volume is laid out in LVM. All the three physical disks(partitions in our case), has the layout similar to the one shown in the above picture. However we have only changed the type of the partitions to LVM, in order to create a physical volume we need to take help of a command called as pvcreate. If you see the above command, we have only supplied partition names to the command as argument. That creates three physical volumes for our LVM. There are two other commands(pvscan and pvdisplay), that provides you with complete information regarding the physical volumes on the system. pvdisplay command provides you with complete information of all the physical volumes on the system. The information provided by pvdisplay command includes UUID of the physical volume, size of the volume, volume name, size remaining etc. [root@localhost ~]# pvdisplay             ---->>display physical Volume information. "/dev/sda6" is a new physical volume of "101.94 MB"
By default the pvdisplay command will display all physical volumes. I have suppressed the remaining two volumes in the above output. Now lets go ahead and understand the second component of a LVM. In the previous section we saw how to label disks or partitions, so that they can be used as physical volumes. The concept behind LVM is to combine multiple physical disks to make one volume group. This volume group will act as a one big hard disk, having the combined size of the physical disks added to the volume group. We will be discussing two important things in this section of volume group, which is the main building block of LVM. Although i feel that i should have explained one of them during physical volume creation, i kept it purposely for this section, because the thing comes into play while creating volume groups. Those two things are mentioned below. As told before, a volume group is nothing but a large pool of disk space created from all the physical disks. LVM is capable of doing operations such as increasing, decreasing the size of a logical volume(which we will be discussing later) because the physical volume is made up of small chunks which are always of fixed size. Each physical disk that combinely makes up a volume group will have a number of small chunks of equal size, where data will reside. This small chunks of equal size, which makes up the physical volumes are called as Physical Extents. Creating a volume group simply combines all the physical extents of all the physical volumes to form one large logical volume group. Let's create our volume group with the physical disks which we labeled during the previous section with the help of a command called as vgcreate. [root@localhost ~]# vgcreate vg00 /dev/sda6 /dev/sda7 /dev/sda8  --->>Volume group creation. Let's now see the complete information of the volume group created with vgdisplay command. [root@localhost ~]# vgdisplay             ---->>Display volume group information. VG Size               300.00 MB        --->>size of volume group. The above command output gives you the complete information about the volume group created. Most importantly, we need to note the below things. You can change the Physical extent size from the default value of 4 MB to whatever you like based on the requirement, while creating the volume group. Lets change the physical extent size while creating the volume group. Keep the fact in mind that, you cant change the physical extent size once the volume group is created. The above command will make the volume group with exactly the same name, but will keep the physical extent size as 34 MB, instead of the default 4MB(which you can verify later on with vgdisplay command). Now lets go ahead with understanding the last component of LVM, which the operating system and the user will be using for storing files and data. The volume group which we just made, is a pool of disk space, by combining all physical extents of all the physical volumes. We can make partitions from this large volume group by creating logical volumes. These logical volumes are the real place, where the user will be accessing the data. There are three kinds of logical volumes in LVM. Lets understand each of them first, and then will see methods to create logical volumes from a volume group. Linear logical volumes are nothing but a logical volume made by simply combining multiple physical volumes to one. Let's take an example, to understand linear logical volumes in a much better way. say you have two physical volumes that have 50 physical extents of 4 MB each. Which means one physical volume is of 200M B (50 x 4). In the above shown example, we have two physical disk with 50 Physical extents of 4 MB each, making a 200 MB disk. While creating a Linear logical volume it will be a combined use of physical extents on both the physical volumes in order. To the operating system the logical volume created will appear as one single disk with 100 physical extent(although the physical extents are spread on two physical disk linearly.). Another important fact to note here is that, it is not necessary to have two physical volume of same size, in other words, you can have a different number of physical extent in two physical volume that will combine and create one logical volume with the size of both the disks. So for example, you can have one physical volume with 60 physical extent and other physical volume with 40 physical extent, that will combine together and form 100 physical extent in one logical volume. Let's go ahead and see the commands, that are used while creating a linear volume in LVM. Above command creates a linear logical volume of 1000 MB with the name of example, on the volume group examplevg. If no unit (M,K,G) is specified along with the -L option in the above command, M is assumed. 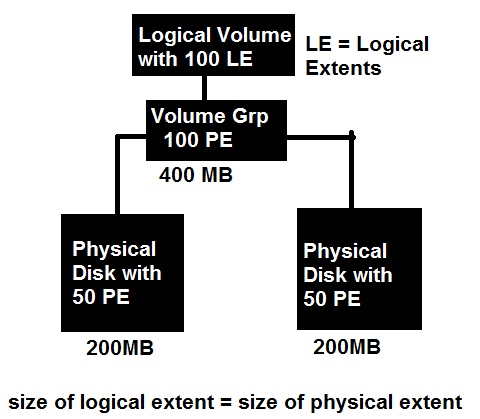 Alternatively instead of specifying the size in megabytes, or gigabytes, you can also specify the number of physical extents to be used in that logical volume with the help of -l (lower case letter) option. Lets see a couple of similar example. the above command will create a logical volume by using 100 logical extents(size of logical extent = size of physical extent), to create the logical volume. Now you if you know the physical extent size, then you can easily calculate the volume size in MB. Alternatively, you can also specify which extents to use from which physical volumes in the volume group. One of the major strength of logical volumes made out of LVM is that, you can in fact control the way data is structured across the underlying physical disks. Lets see how data is structured when we configure stripped logical volume. Stripped logical volume is very much similar to raid level 0. In stripped logical volume, data in the underlying physical volume is stripped across the number of physical disks. Similar to raid level 0 which employs striping across the disks, a logical volume with striping will improve both sequential read and writes. If see the above picture, the data is striped across three different physical disks. First stripe is on the first physical disk, second stripe is on the second and so on. You can create a striped logical volume with the help of lvcreate command. Creating a striped logical volume can be done by using -i option in lvcreate command. The number specified using this option is the number of physical disk, that the logical volume will be stripped. Let's see the below example . The above command will create a striped logical volume with the stripe size of 64 kb, and a total size of 10G, and will use 2 physical volume for the stripes, and will be named example, on the volume group named examplevg. You might remember that, you can create a volume group from different sized physical volumes. In that case the maximum size of a striped logical volume can only be equal to the size of the smallest physical volume. Mirrored logical volumes are very much similar to raid level 1 in which data is mirrored across the number of disks used. It provides better redundancy for the data. In easy words, you can say that an exact replica copy of one physical disk is present on the other physical disk. While creating logical volume with mirrors, you can give multiple mirrors for the data. Mirroring of a logical volume requires at least three physical volumes. 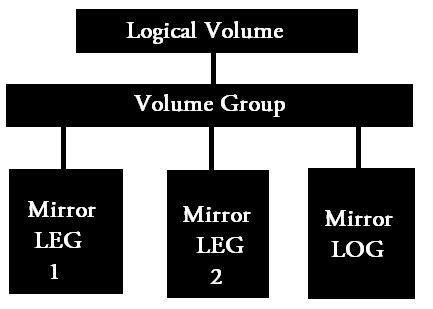 In the above example, the first two physical volume acts as two mirrored legs, and the third one stores the log, of what is synced in mirrors and what is not synced in the mirrors. Let's now go ahead and create a logical volume with mirroring. 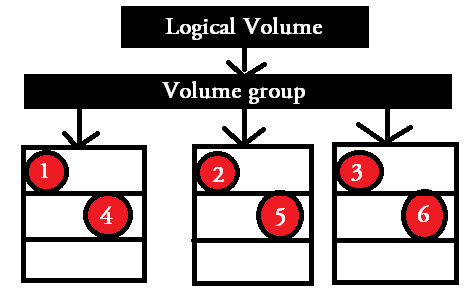 In the above command, -L option is used to specify the size of the logical volume, -m option is used to specify number of mirrors for the logical volume(in our case we have used one mirror), and the name of the logical volume is mirrorexample and is created from a volume group known as examplevg. Specifying the m1 option will create two copies of the file system, one is the linear volume and the other is the mirror of the volume. Hence if you want two mirrors then you need to specify -m2 option with lvcreate command. You can always convert a linear volume to a mirrored volume or a mirrored volume to a linear volume by using the below method. the above command can be used to convert the linear logical volume to a mirrored logical volume with one mirror, and its name is /dev/vg00/lv0. With the help of the above command, you can remove mirroring from a logical volume named /dev/vg00/lv0. Note: In all the above shown example's of creating logical volume of any type, you need to first format the logical volume with your required file system, similar to the formatting done on any normal partition, and mount them to use. Let's now have a look at different commands of LVM and see what they does. We will also be seeing methods used to resize an existing logical volume and much more. How to resize an LVM, logical volume? Resizing of a logical volume can be done by simple lvextend and lvreduce commands in Linux. We will be going through both increasing as well as decreasing the size of an LVM in Linux. The first step that needs to be taken before resizing is to unmount the logical volume if its currently being used. Let's begin by increasing the size of the LVM. [root@localhost ~]# lvextend -L +50M /dev/vg00/lv00  -->> I am increasing logical volume to 50mb. The above command, can be used to increase the size of the logical volume by 50 M. -L is used to specify the amount of size to increase, and then the last argument is of course the logical volume name. Now let's make the volume group active before using the resized logical volume with the help of the below command. [root@localhost ~]# vgchange -a y vg00      --->>activating change. Now before mounting the resized Logical volume, lets format the newly added space with the help of resizefs command. Performing an on-line resize of /dev/vg00/lv00 to 208896 (1k) blocks. The filesystem on /dev/vg00/lv00 is now 208896 blocks long. Now you can simply mount the logical volume, at your required mount point, and start using the increased size of the logical volume. Let's now see the method used to decrease the size of a logical volume. Its always recommended to do an fsck file system check before reducing the size of the logical volume. After running fsck, you need to first unmount the file system, and then reduce the size of the file system with the help of resize2fs command as shown below. Resizing the filesystem on /dev/vg00/lv00 to 102400 (1k) blocks. The filesystem on /dev/vg00/lv00 is now 102400 blocks long. Note the fact the 100M specified in the above command, is the final size of the file system after reduction(it is not the size by which the file system will get reduced to, but is the final size of the file system). Now you can reduce the size of he logical volume by lvreduce command as shown below. [root@localhost ~]# lvreduce /dev/vg00/lv00 -L 100M  -->>I am reducing logical volume to 100mb. In the above command also the logical volume is reduced to 100 M not by 100 M.
Now you can simply mount the volume back and confirm the new size. We will be coming up with a second part of this post, which will be discussing some interesting things like the following. As well as some other interesting LVM commands. Where i can access the mirrored lv. Am quite not clear about your question. Do you want to create a Mirrored logical volume? In Any case, you will have to mount it under a directory and then access it like any normal partition(I have explained mirrored LVM in this article.).. how to disk stripping using lvm?? how disk mirroring and stripping using lvm and how to do monitor disk stripping and miiroring in lvm??? Admin, thank you so much for this informative site, this is one of best known sites for linux. I have a Question in LVM, what is the difference among lvm version 1,2 and 3. I have LVM in my system with 500 gB data, i wna to migrate from LVM to normal partition. Ho can achieved this, without loosing data, I don't have any extra harddrive. Unfortunately, you either need another 500G space in the existing drive, so that you can create another normal partition to back up the entire logical volume using dd. Or any external medium is very much required, to prevent data loss. Excellent tutorial for types of LVM. the title "The Advanced Guide to LVM-Logical Volume Management on Linux: PART 1" implies to me there is more (i.e. PART 2, 3, ...) coming? Am i wrong? Nice Explanation with clear example.. I have mounted partitions it is full how to resize or increase the partition. I can't find part2 of The Advanced Guide to LVM-Logical Volume Management on Linux. Please send me link, if it not released yet than please do it asap. This will be very helpful. What is the best procedure to reduce /var which has all the logs keeping writing everytime. ?